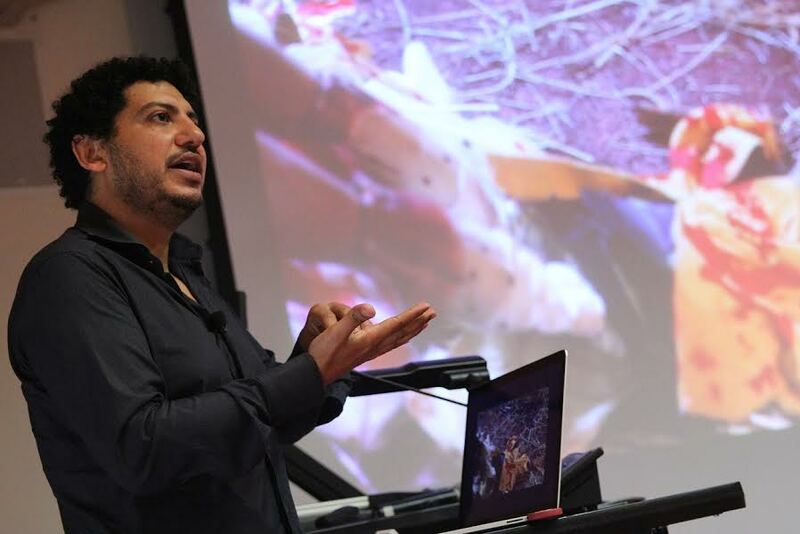 Doha, Qatar: Internationally celebrated Egyptian artist, Wael Shawky, shared his perspective on contemporary narratives of uncertainty and change, as well as his unique methodologies as an artist, storyteller, filmmaker, and educator during a community meeting at Northwestern University in Qatar. His presentation, “From Wet Culture – Dry Culture (2003) to Cabaret Crusades (2010–2016),” addressed the changing form his art has taken over his career, comparing one of his earlier exhibits Wet Culture – Dry Culturewith his most recent film trilogy, The Cabaret Crusades. “Shawky’s work is an interesting combination of art, politics, and religion. His methodologies relate to research topics and teaching themes currently being explored by our students and faculty. Inviting him to share his thoughts on the depiction of actual historical context through film and art is an integral part of the ongoing interdisciplinary dialogue at NU-Q,” said Everette E. Dennis, dean and CEO. The session focused on Shawky’s unique approach to creating art. Based on research and inquiry, he creates work that tackles notions of national, religious, and artistic identity through film, performance, and storytelling. “To be an artist is unique because it enables you to speak a global human language. You have to create work that speaks to humans and tells stories,” said Shawky, who is currently exhibiting some of his work at Mathaf: Arab Museum of Modern Art, and at the Fire Station Gallery. “My art analyzes the way humans believe in written history, because in my opinion, it needs analysis – that’s why I try not to invent or change any part of the script. The scenes in my work are taken as they are written and recorded in historical contexts, and that is part of my criticism of it, because these scripts are believed and become sacred,” he added. Shawky’s work has been described as art that frames contemporary culture through the lens of historical tradition and vice versa. A native of Alexandria, Egypt, where he still resides, Shawky uses a range of media to produce work that explores issues of history, religion, culture, and the effects of globalization in society in his home country and beyond. In photographs, installations, videos, and performances, he mines traditions of entertainment and performance through multilayered historical reconstructions that force viewers to navigate the territory of truth, myth, and stereotype. According to Shawky, film is the most effective method of communicating due to its time dimension. His recent solo exhibitions include Kunsthaus, Bregenz (2016); Fondazione Merz, Zurich (2016); MATHAF, Doha (2015); MoMA P.S.1, New York (2015); K20 Düsseldorf (2014-15); Serpentine Galleries, London (2013-14); and many others in the United States, Europe, and the Middle East. He has participated in the 14th Istanbul Biennial (2015); the 11th Sharjah Biennial (2013); Documenta 13, Kassel (2012); the 9th Gwangju Biennial (2012); SITE Santa Fe Biennial (2008); the 9th Istanbul Biennial (2005); and the 50th Venice Biennale (2003). His recent awards include the inaugural Mario Merz Prize (2015), the Award for Filmic Oeuvre created by Louis Vuitton and Kino der Kunst (2013), the Abraaj Capital Art Prize (2012), the Schering Foundation Art Award (2011), as well as The International Commissioning Grant and an award from the Lower Manhattan Cultural Council in 2005. Shawky founded the educational space MASS Alexandria in 2010.